Teams from four North Texas colleges and one from Ohio State University competed Thursday to be the “greenest” team at the inaugural College Football Playoff National Championship. Each team of 10 members competed to plant 10 trees at the new High Oak Park in Arlington faster and better than its competitors. The area tree planting teams were from the University of Texas at Arlington, Brookhaven College, Dallas Baptist University, University of Texas at Dallas and Ohio State University students and fan club members. Referees timed the teams’ performance and monitored their adherence to tree planting rules and procedures. Any variation in planting rules could earn a “flag on the play” and cost the team points off their score. The visitors from Ohio came in first. A UTA team was second, and Brookhaven College team was third. The event was sponsored by the U.S. Forest Service, the Texas Forest Service, Employer Flexible (a local business solutions firm) Dr Pepper and the city of Arlington. 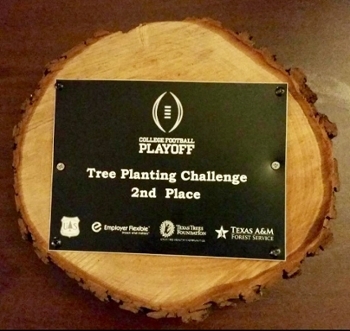 The Texas Trees Foundation organized the competition.